This is the BIG ONE everybody! The annual celebration of the wonderful and peculiar culture of “the record store,” during which albums are birthed, bands make a racket, food gets et, and money is raised for the medical bills of local bluesman and bon vivant Guitar Lightnin’ Lee! 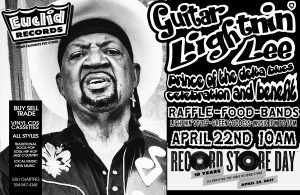 You may have heard back in the cold of January that our good buddy and yours, the PRINCE of New Orleans R&B and noted “Hater of Pizza,” GUITAR LIGHTNIN’ LEE, was beginning treatment for cancer. Lightnin’ has helped us throughout the years with musical performances and stout good cheer, so we’re celebrating the man and shakin’ the can for Record Store Day! In the back yard, killer CRAWFISH from GREEN GODDESS, proceeds to Lightnin’! Limited Edition T-SHIRTS, proceeds to Lightnin’! A big raffle, proceeds to– you get the drift! We love you, record friends, in large amounts! Thank you for another year, and thank you for helping us spin this crazy event into a real engine of positivity! —- > The incredible purveyors of palliatives over at Pirogue’s Whiskey Bayou in Arabi, Louisiana will be pouring mimosas for the die-hards what line up BURLY EARLY! Maybe you will see them? Maybe they were just a dream?! —- > Repeat, if we may? There are some RECORDS en route, my friends! I mean, wow. Like Chester Arthur Burnett said, “great googly-moogly!” He’s the Howlin’ Wolf, don’t ya know! *** CRAWFISH from the restaurant FRANK SINATRA JR. JR. himself gave “10 out of 5 stars, out of this world, bananas, truly bananas!” The Green Goddess! All proceeds to our buddy Guitar Lightnin’ Lee and His Thunder Band!!! Another year of live music from customers we love! 1:45pm – STOO ODOM – Our man on the low end charted desert courses with Thin White Rope, lanced some boils with The Graves Brothers Deluxe, and soundtracked that morally ambiguous dream you forget every night! Lots of grumbling beauty from this guy forthcoming, drink it up or have you learned nothing? 3:00pm – THE ESSENCE – Beats and rhymes! In fact, the motor theory of speech perception predicted that phonetic decoding would be possible only via a system that knew how phonemes were produced, so that a sound heard could be related to how that sound was produced. In consonance with this view, electrical stimulation of THE ESSENCE’s area for speech control in the human frontal lobe has been shown to alter aspects of both speech encoding and decoding! It’s true! 4:00pm – GAR GAR – A “WEIRDO” punk rock band! Maybe they’re weird, maybe they’re not, but have YOU been on KTVE’s “Louisiana Living” television program, broadcast at mindwarp speed into the houses of norms during breakfast? We sure haven’t! GAR GAR! 4:45pm – RAFFLE DRAWING (do not need to be in attendance to win!)! 5:00pm – PATRICK SHUTTLESWERTH – Not sure what to do about this big-rockin’, back-sassin’, muttley krewe (lol), but they ROCK LOUDLY and carry a BOSS ATTITUDE, so look out! Look in! Get with it! 6:00pm – The Bongoloids!!! as THE BONGOLOIDS!!! Sign up for our newsletter OOGSEY MOO! Be the first to know about events and stuff!